The diagram shows a metal plate OABC, consisting of a right-angled triangle OAB and a sector OBC of a circle with centre O. 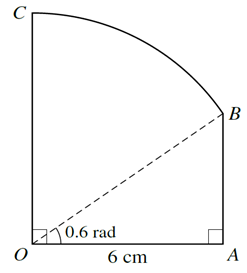 Angle AOB = 0.6 radians, OA = 6 cm and OA is perpendicular to OC. i. Show that the length of OB is 7.270 cm, correct to 3 decimal places. ii. Find the perimeter of the metal plate. iii. Find the area of the metal plate. We are required to show length of OB=7.270 cm. It is evident from the diagram that OB is the hypotenuse of the right-angled triangle OAB. Let’s find all these elements one-by-one. We are given the first on; . Next we have to find AB. It is evident from the diagram that AB is the perpendicular of the right-angled triangle OAB. Next we need to find length of arc BC. Arc BC belongs to sector OBC of a circle with centre O. But we also need angle BOC to find length of arc BC. It is given that OA is perpendicular to OC. Now we are in a position to find the length of arc BC. Finally, we can find perimeter of the metal plate. First we find area of triangle OAB. Next we need to find area of sector OBC. We have found in (ii) that OB=OC are radii of the circle with centre O. We have found in (i) that OB=7.270.